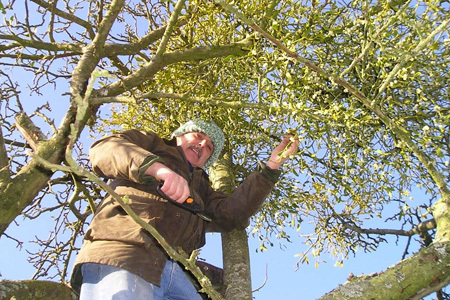 A Busy Day With The Mistletoe! 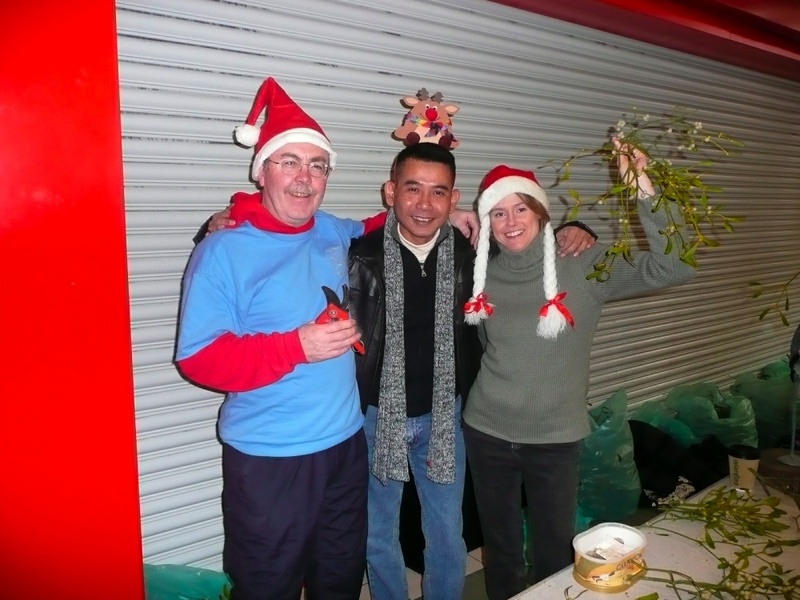 We had a busy and successful day selling mistletoe and Fleet Pond merchandise last Saturday – over £350 was collected! Final Reminder: Fleet Pond Photo Competition! 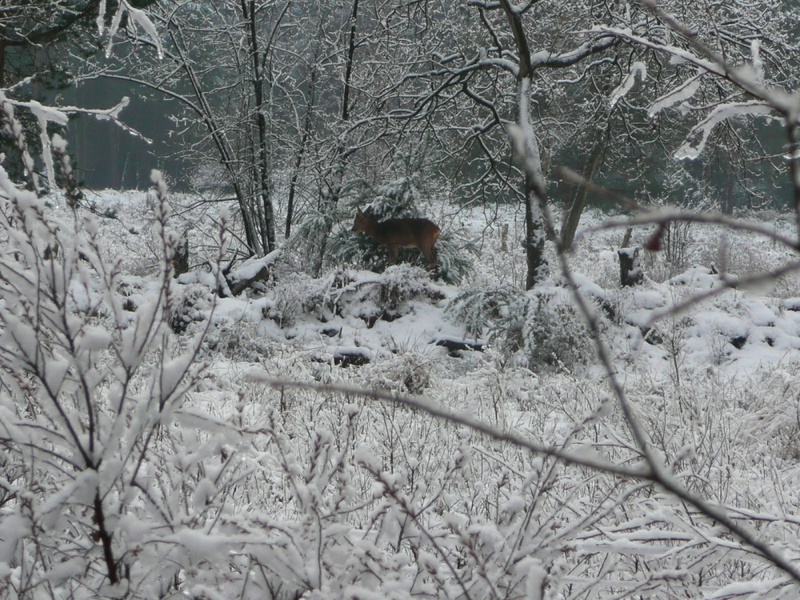 The deadline for this year’s FPS Photography Competition is fast approaching – 31 December 2009. The recent onset of snow (see above and below) may provide some excellent opportunities for superb and competition-winning entries! Tip: Remember when you are having the digital photographs printed consider the aspect ratio, especially if you are printing 6×4. Further information can be found here and here. Please note that this year’s competition categories are: Work or Play, Sunrise or Sunset and Birds. Important update: We are considering producing a Fleet Pond calendar and Christmas cards, for sale next year. If you have some winter scenes that you’d like to be considered for possible use, we’d be delighted to receive them – please forward them to the same address as the competition (details above). 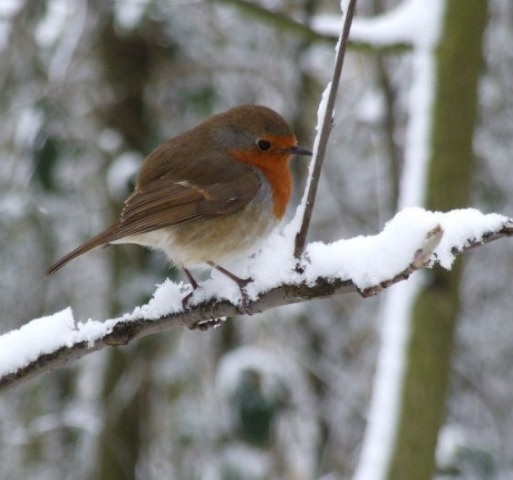 Fleet Pond Blog Wishes All It’s Readers, Supporters And Contributors A Very Happy Christmas! Fleet Pond Blog is run by Fleet Pond Society. If you’re interested in joining the Society please see here (information on Fleet Pond itself is available here). The BTCV Carbon Army Challenge to conservation groups was to carry out 3,000 days of voluntary work as an example of practical positive climate change action by 18 December – the last day of the UN Climate Change Conference in Copenhagen. That target has been reached and bettered. On 16th December the total number of days committed was 5,939! 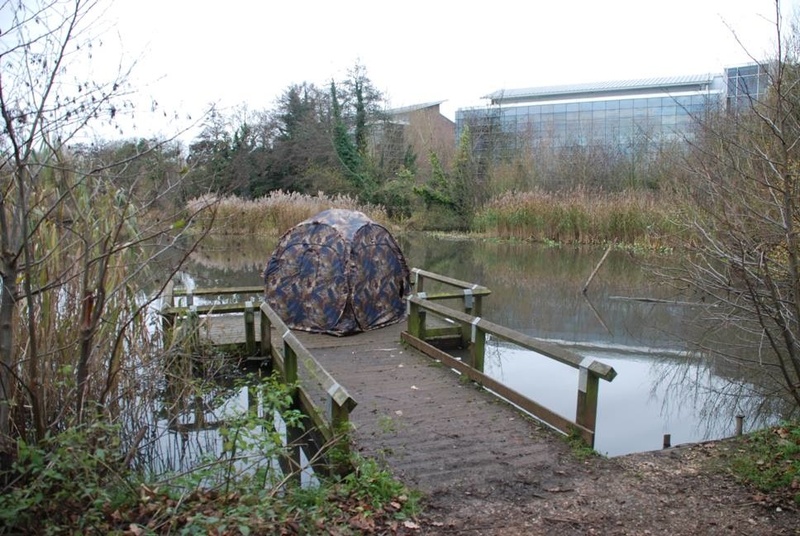 At the Fleet Pond Society we were among the huge number of conservation groups that committed hours of work towards reaching this target by registering two of our volunteer sessions. The stipulation was that the days worked had to be carried out during the Copenhagen Summit. While the politicians talked – we worked. In the first session, on a beautiful sunny Friday morning at the beginning of December, three volunteers, myself included, replaced a section of the post and rail fencing which had unfortunately been damaged and pulled down. This fencing is important as it allows pieces of land to be sectioned off and protected from walkers, runners, cyclists and other pond users to enable the area to develop undisturbed. This particular corner is home to many bluebells in the spring that would be crushed if not protected. We soon got into the rhythm of digging holes for the poles, cutting the lengths of rail and hammering everything into place. Nick and I learned a new skill from Terry, working with the ‘post-hole digger’. This tool makes the job of digging post holes so much easier – once you have got to grips with operating it. Once the tool is pushed down into your semi-dug post hole you then need to push the two handles together in order to lift the soil out, rather than pull them apart, the more natural movement, otherwise the soil falls back into the hole. 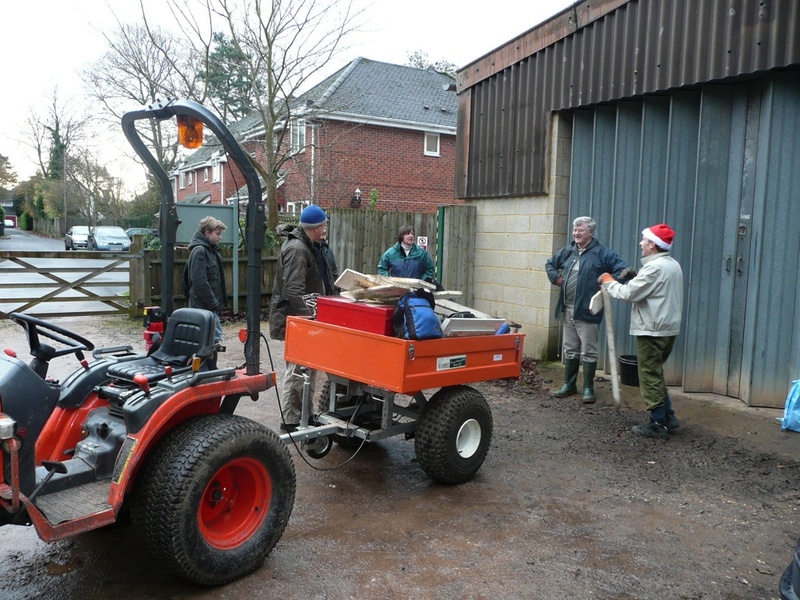 The second volunteer session was our regular monthly conservation work-party. 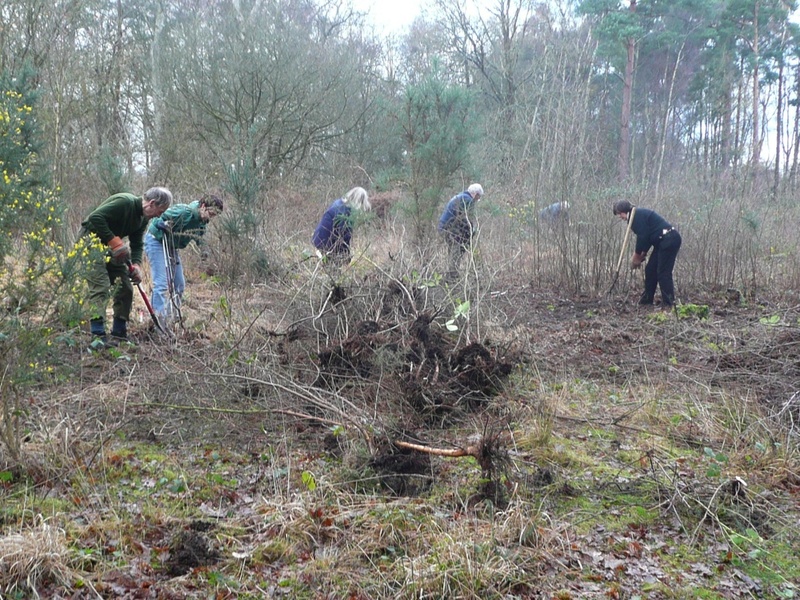 About 15 people turned up on a crisp Sunday morning at 9.30am ready to do battle with the birch saplings and bramble which had grown up on the dry heath near the car park. At first glance, it seemed as though it would take us a lot longer than the morning to penetrate the mini forest. However, with everyone setting enthusiastically to work we had made great progress by the 11am coffee break. Several people had very kindly brought tasty festive treats to share and these were washed down by welcome hot drinks. After our warming break we set-to again and by early afternoon the area was clear and the bonfire blazing under the guidance of David and Colin, the two fire masters who ensured that the fire remained contained until it had burned itself down to a small glow when it was then put out with water. As I write this the delegates in Copenhagen seem to be having difficulty coming to any sort of agreement. The BCTV are hoping that the total volunteer days will reach 6,000 by the end of the Climate Change Conference, double what they asked for. We contributed 68.5 person-hours to that total. It feels good that here in Fleet in small practical ways we continue to work towards improving our environment and through this, our planet. Visit http://www2.btcv.org.uk/display/home for further information on the Carbon Army Challenge and the BTCV. Thanks to two of our chums from the Fleet Lions, there will be plenty of opportunities to steal a kiss this Christmas! 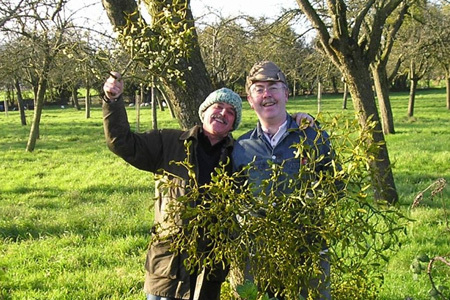 Laurie and Jim have been on a mission for the Fleet Pond Society, to deepest Somerset to harvest an orchard of festive fun and returned with a bumper crop! 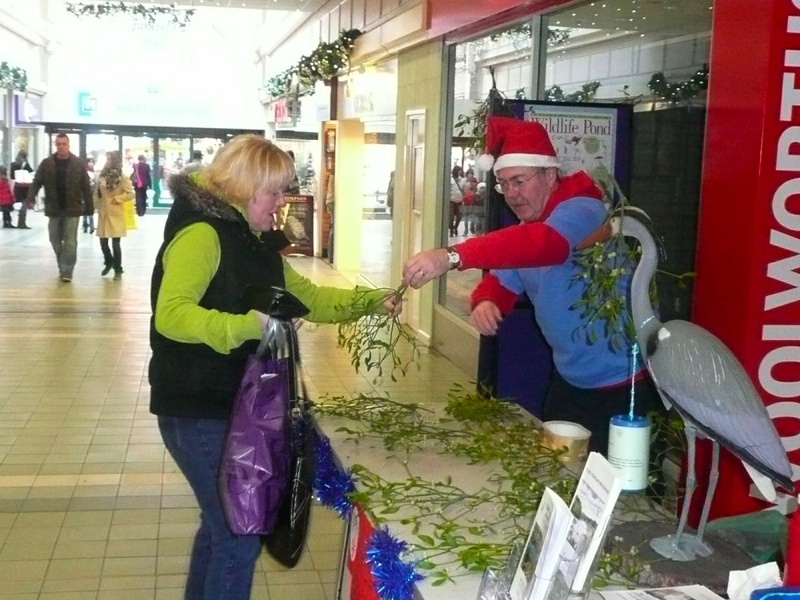 We now have a messy mass of mistletoe – so if you want to liven up your Christmas, come along to the Hart Shopping Centre in Fleet on Saturday, 19th December and purchase a sprig or two. We will be outside the old Woolies from 9am to 4.30pm, with not only plenty of mistletoe, but a selection of Fleet Pond merchandise, including our new range of four postcards featuring some beautiful photographs of the pond. There will also be the opportunity to order from a range of clothing decorated with the stylish Fleet Pond Nature Reserve logo. 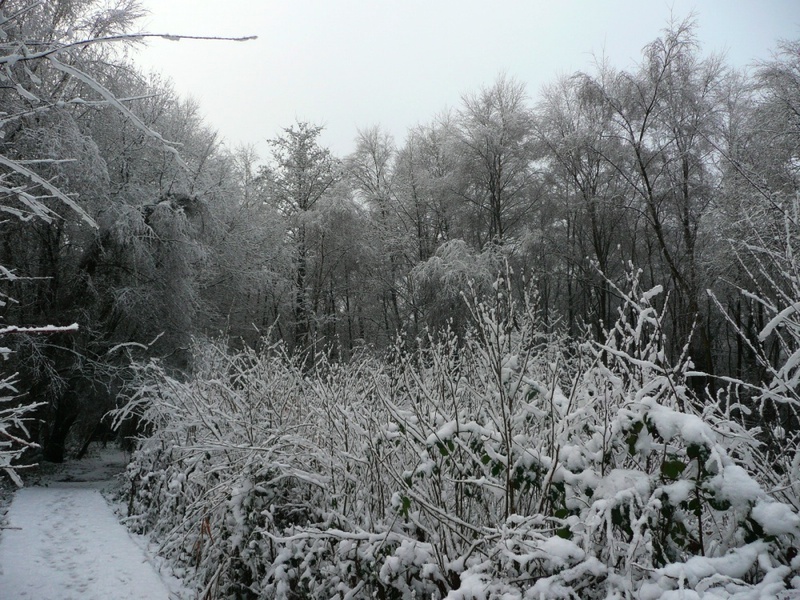 “I have decided to relocate the 13th December task to the Link Glade which is creating a heathland link between the Dry Heath, around the car park, and the small open space we call the Green. It is called the Green because it is the last remnant of the Army Golf Course that once lay between here and the Bramshot Bridge over the railway line. 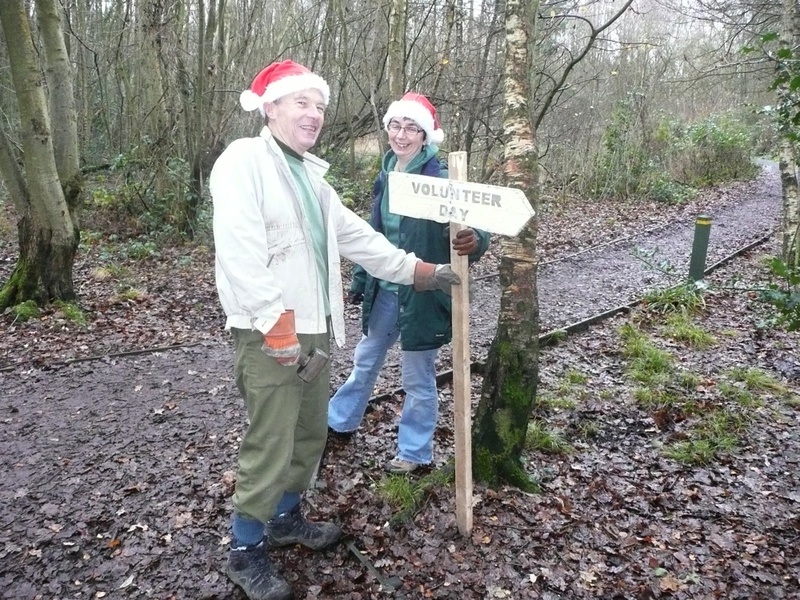 Further details on the volunteer event schedule and related matters can be found here. More Tips For The Photo Competition! The deadline for this year’s FPS Photography Competition is fast approaching – 31 December 2009! General: The Photo Tips And Techniques site from Kodak is exceptionally well designed and covers all aspects. People: There are 30 tips for photographing people here and 19 portrait photography tutorials here. Birds: Photographing birds is very tricky! There are 5 steps for getting great bird photos here. The box at the bottom of the right hand sidebar of this blog gives links to some impressive photos taken at Fleet Pond (most are of birds). To get photos of this quality it’s often necessary to use a hide (as above). We wish you much success with your photography and we’re looking forward to your creative submissions! You are currently browsing the Fleet Pond Blog blog archives for December, 2009.